On the evening of 22th December weather conditions finally changed to better. Humidity was up with temperature around -8°C. At the Louekallio ski-resort snow guns produced a crystal cloud and action lasted few hours until crystals suddenly vanished. Singly oriented columns dominated the swarm. With HID-modded Cyclops Thor Platinum X-15 lamp the display looks quite the same what we have seen already in haloreports, except that there is weird spots on both sides of the upper tanget arc (photo above, see also enhanced image). They seem to extend through the 22° halo towards the lamp, but this may be due to divergent light. In simulations arcs that bear some resemblance to these spots can be produced with slightly tilted Parry crystals, but we certainly need more photos to say what is going on. connected with the new effect, but closer look reveals they are two separate halos. Diffuse arcs were observed opposite to the lamp. 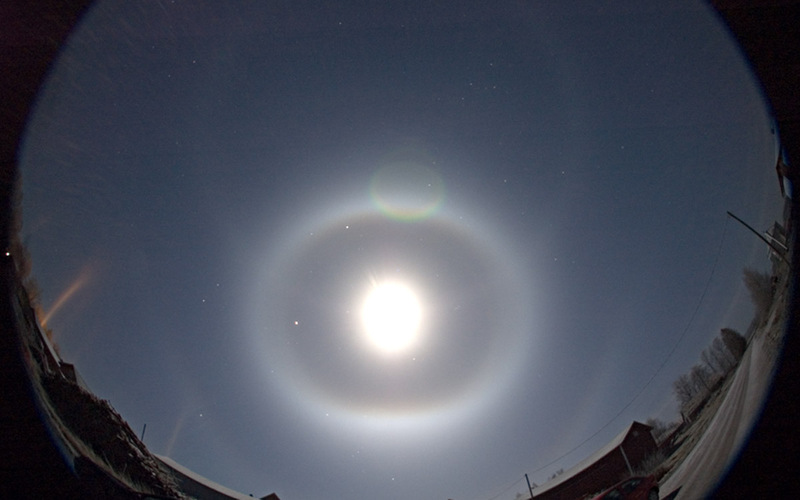 In the moon light, circumscribed halo, infralateral arcs, 46° halo and full parhelic circle were seen. The long Wegener arc, which continues close to infralateral arcs, was not seen visually. See also another photo of this stage. Later on ice crystals turned to be more randomly oriented. Moon elevation was 52°. Similar column dominated display was also noticed by Arto Oksanen in Muurame. See his photos here. 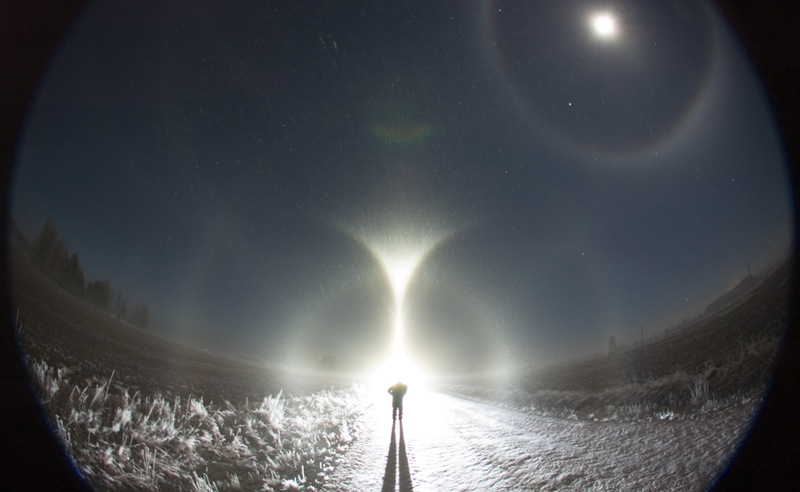 When 0ksanen first noticed the display, there was Wegener arc above the parhelic circle and he hurried for the camera. Unfortunately, the best moment was gone when he was back. "By the time I got camera from inside, halos had weakened and of parhelic circle only a trace was visible", Oksanen tells. 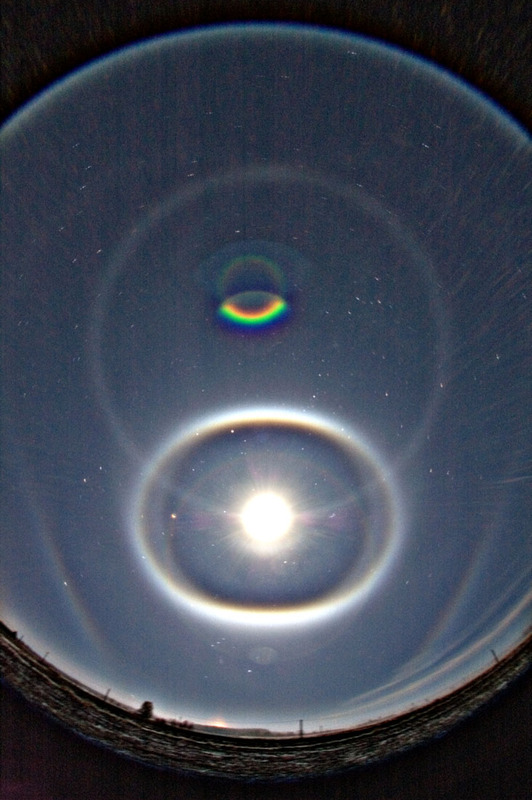 Those Moon halo -photos are remarkably beautiful. It must have been a pretty sight. 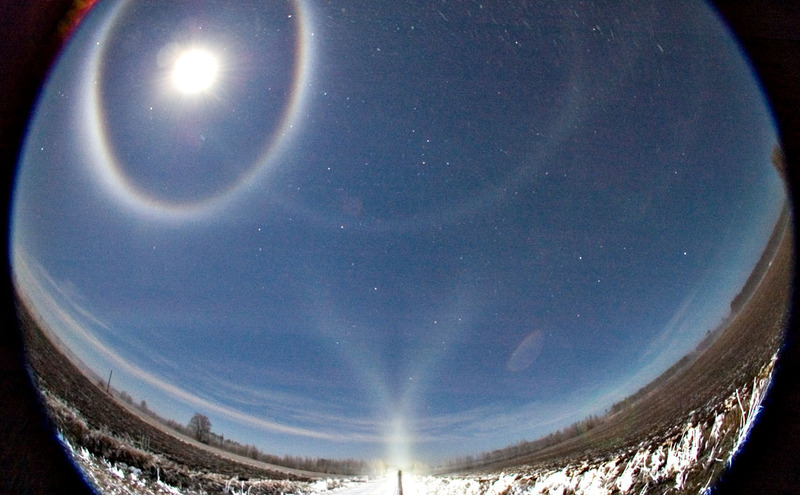 It is strange, that those arcs through the 22 halo (in the lamp-halo shot) have not appeared in any other photos although people have captured numerous displays during the past few winters. If it is a genuine halo it must arise from peculiar orientation of crystals (or from peculiar crystals...). The Mikkilä arcs! I have difficulties to imagine those spots as artificial. Too much co-incidence to have them symmetrically on both sides and right on 22 halo. And they look like halos. I am starting to belive there is infinite number of halos from water ice alone. Perhaps we should refrain from naming new halos after people to avoid a mess. This display, in comparison with others, proves that the lamp display intensity is pretty much unrelated to moon display intensity. Sure, if you have a great moon display the lamp display is probably good, like here. But good lamp display may come with no moon halo at all, like one of the cases I saw. Amazing stuff. Am I mistaken or is there a lower suncave parry arc in the Moon.jpg shot? Yes I was the first to see than myself. When I looked at the moon display I could see lower suncave parry extending towards the parhelic circle. Just amazing to see two simultaneous halo displays at once!! Thats now probably every halowatchers dream for those who are fortunate to live near a ski resort. I dont see that. The lower suncave Parry should be strongest below the tangent arc and I see only a lens reflection there. The vaque extensions towards the parhelic circle seem just artefacts that there are plentifully in the photo. I was wrong. The lower Parry arc is of course strongest where it is tanget to 22 circumscribed halo, here at 07:00-08:00 and 16:00-17:00 positions. One of the *the* displays of the season. 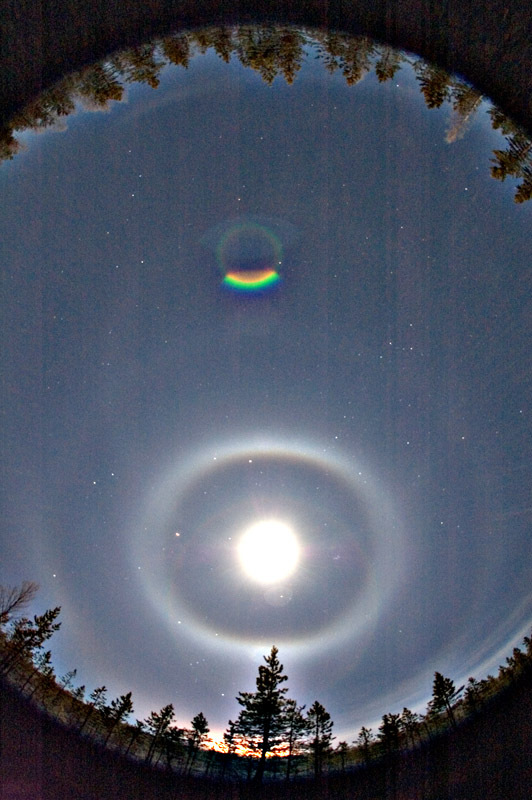 I can't help but revisit these lunar halo shots every now and then. Their intensity is something to remember.